The Bornean Bristlehead (left) is a strange and unique bird, endemic to the lowland forests of Borneo. 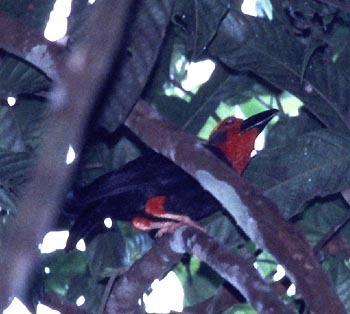 It is a rather rare and elusive canopy dwelling species about which little is known. The best information available was published recently by Simon Colenutt (2002) [available on-line on the Oriental Bird Club web site], and this article includes photos by Chris Artuso that are "thought to be the first known of this species." I'm not sure about that claim (e.g., Jon Hornbuckle's report of his Borneo trip in 2000 mentions video of Bristlehead taken by Ashley Banwell) but photos of it are few indeed. My distant effort is below; the fine shot (left; taken in Danum Valley, Borneo, in June 2002) is by James Eaton. He describes his experience: "The bird was one of a flock of 3 that we first heard calling in the canopy at a small clearing at W8 [on the research centre's grid system], I think. This was on my first day at Danum, I quickly played my minidisc which brought in the birds to a point, including this fine male, and incredible noise to go with an incredible bird. Over the next 12 days at Danum I was fortunate to get many more sightings, including much closer views, but was unable to photograph them due to light or them being right above me in the lower canopy." There has been much confusion over its relationships and affinities. Smythies, 3d ed. (1981), for example, considered it a member of the wood-shrike family (Prionopidae); more recently, MacKinnon & Phillipps (1993) placed it with the corvids (crows and jays). Using biochemical evidence, Ahlquist et al. (1984) indicated that its closest relatives were the artamids (the wood-swallows of Australia and New Guinea) and the cracticids (currawongs and butcherbirds). Sibley & Monroe (1990) placed it with the wood-swallows, the two New Guinea peltops, and Australian cracticids in tribe Artmini amongst their vastly enlarged Corvidae family. Clements (1991) elevated this "tribe" to family status, thus placing the Bristlehead in the Artamidae family (with wood-swallows, currawongs, butcherbirds and others). More recently yet, I'm told that the Handbook of the Birds of the World project will elevate the Bristlehead to its own monotypic family, the Pityriaseidae. I follow that HBW approach here. It makes good sense to me. Accepting that the Bristlehead's closest relatives are wood-swallows, peltops, and currawongs, it is widely separated geographically from any of these species and has clearly evolved into a quite different bird. Long isolation on Borneo would have deepened the evolutionary divergences, and thus treating it as a family-level unique species best recognizes its uniqueness. Treating the Bornean Bristlehead as a monotypic family elevates it to a special status. Among the monotypic families of birds on earth, it becomes one of the most difficult to observe in the wild. It competes with Shoebill [Balaenicipitidae], Ibisbill [Ibidorhynchidae], Kagu [Rhynochetidae], Plains-Wanderer [Pedionomidae], and Hypocolius [Hypocoliidae] as the most difficult family to "acquire" in a birder's life. Most of the trip reports I've read from Borneo mention just how difficult it was to find. Colenutt (2002) refers to one group of six birders who did dawn to dusk birding in the primal lowland forest around Danum Valley Field Centre in Nov 1998, but who had only two observations of bristleheads: a group of 6 birds and another of 2 birds. My experiences with Rita Carratello in August 2003 are similar. We spent 8 days birding prime lowland forest in the Danum Valley Conservation Area at Borneo Rainforest Lodge, and another in prime habitat at Sepilok, and saw only one group of 3 birds (including the one shown here). We heard them on two other days (once at Danum, once in Sepilok). I had missed them entirely during an earlier four-day Danum Valley visit in 1988. I feel very fortunate to have taken even this distant photo (right; with bird enlarged in the inset) at the top of Bornean dipterocarp tree. A small white wing-patch was seen in flight. Behaviorally it moves in small groups (usually 6-10 birds, although we had but 3) through the canopy where it crouches and peers "around like a tailless coucal, looking for insects" (MacKinnon & Phillipps 1993). Insects are devoured from branches and tree-trunks, but are also taken by sally-gleaning; fruit is also eaten (Colenutt 2002). We watched it hop among the top branches of tall trees and then make short glides or flight with shallow wingbeats to other high branches. It apparently flocks with over canopy species, such as Black Magpie Platysmurus leucopterus, drongos, and malkohas, but our party of three was traveling alone. Bornean Bristleheads are noisy birds, keeping up a variety of contact calls among the group. The primary calls are loud downslurred whistles on a minor key interspersed with a corvid-like chatter, and not at all like the tapes we had reviewed for our trip. Apparently bristleheads have a wide variety of calls and the primary call was not recorded on the tapes we had (e.g., Whitehouse 2000). Bornean Bristlehead is a jay-sized, chunky, short-tailed black bird with a red head and neck, red thighs, a yellowish-orange bare crown with short orange growths on the skin (accounting for the name), and a massive hooked bill. The bill is the feature that most recalls currawongs; it is nicely shown in this additional shot (left) by James Eaton. Colenutt (2002) describes Bornean Bristleheads as using both primary and partially logged forests. Their appearance at any particular site may be seasonal as sometimes at Danum Valley and/or Sepilok they seem more regular than at other times. Wangkong Intal, a local guide at Borneo Rainforest Lodge, told me that they are present throughout the year there, in both "dry" and "wet" seasons, but that finding them was sometimes difficult and unpredictable. Although some trip reports mention seeing them from the canopy walkway, hours spent by us there (and on a canopy tower in Sepilok) were not successful. Hours of walking the access road to the Lodge was the eventual winning strategy. Very little is known about the breeding biology of Bornean Bristlehead. They make bulky cup-like nests recalling those of the Australian cracticids (Colenutt 2002. It may have a protracted breeding season. Given that it lives primarily in small groups, I wonder if these are extended family groups and whether bristleheads use helpers at the nest. Answers to these questions are apparently not yet known. Bornean Bristlehead remains an elusive and enigmatic bird, endemic to the lowland forests of Borneo, where many discoveries remain to be made. Photos: The Bornean Bristlehead Pityriasis gymnocephala at the top and bottom of this page was taken by James Eaton in June 2002 at the Danum Valley Research Centre, Sabah, Malaysia. 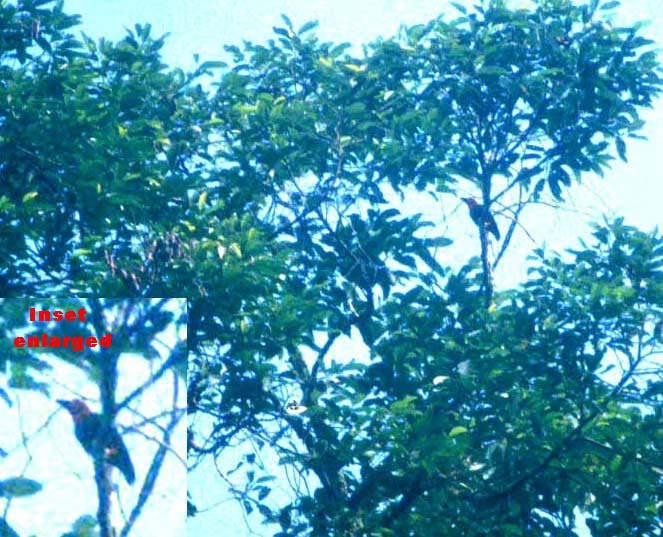 I photographed the distant bird, middle shot on this page, on 7 Aug 2003 near Borneo Rainforest Lodge, Danum Valley. Photos © 2003 Don Roberson and James Eaton, as indicated, and used with permission; all rights reserved. Bibliographic note: There is no "family book" per se, and very little has been published about this species. The most thorough discussion I know is Colenutt (2002). I look forward to the Handbook of the Birds of the World chapter. Ahlquist, J. E., Sheldon, F.H. and C.G. Sibley. 1984. The relationships of the Bornean Bristlehead (Pityriasis gymnocephala) and the Black-collared Thrush (Chlamydochaera jefferyi). J. Ornith. 125:129-140. Clements, J. 1991. Birds of the World: a Check List, 4th ed. Ibis Publ., Vista, CA. 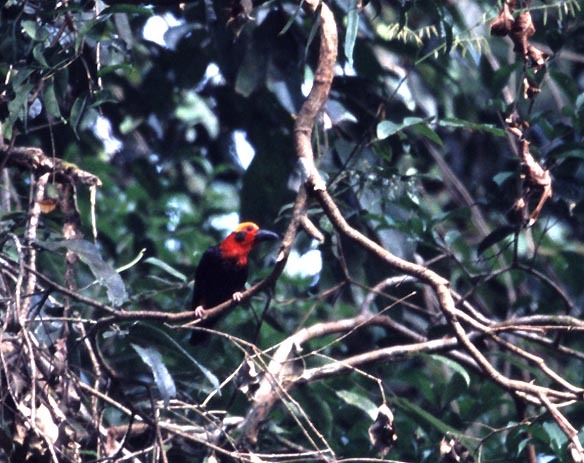 Colenutt, S. 2002 Little-known Oriental bird: Bornean Bristlehead. Oriental Bird Club Bulletin 35:75-77 [on-line here]. Smythies, B.E. 1981. The Birds of Borneo, 3d ed. The Sabah Society, Kota Kinabalu. Whitehouse, S. 2000. Bird sound recordings from Sabah, Borneo. S. Whitehouse, U.K.